If you're already planning for future college costs, you've overcome the biggest obstacle: getting started. Rising tuition, unpredictable market returns, and tight budgets often scare parents into inaction. But once you put a plan in place, you'll find everything is much more manageable. The solution: Start today and invest as much as you feel comfortable with. 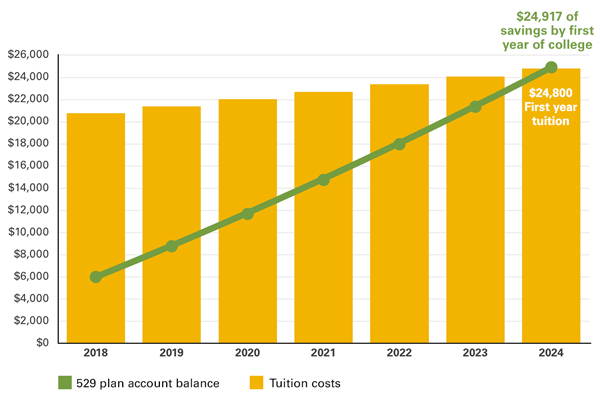 You can't control tuition prices, but you can control how much you save from now until your child starts school. Plus, earning compound interest on your savings may help offset tuition increases. If your child is getting older, and closer to high school graduation, you may feel like it's too late. But saving now can still make a difference. Over the next 6 years, Emma's account earns a 5% average return, giving her almost $25,000. Even with 3% annual tuition hikes, that's enough to pay for Emma's first year of school. In total, her 529 account adds up to about 25% of Emma's 4-year tuition costs. The situation: Over the past 10 years, the stock market has been bullish overall, but few economists expect that to continue*, creating an investing dilemma: You want to stay ahead of rising tuition costs, but you also want the money available when you need it. The situation: If you're like many families saving for college, your household expenses compete with your savings goals. Contributing $150–$200 monthly to your 529 account seems unrealistic. After all, you still need to save for retirement and pay your bills. The solution: Ask family members and friends to consider contributing to your 529 account on special occasions. Small gifts can add up to thousands of dollars over the years. Many plans allow you to create a code that makes it easy for others to deposit money directly into your account. Graduations—from kindergarten through high school—are a natural time for family and friends to add to your child's savings. For most people, there's no easy way to save 100% of college costs. That's why it's important to set realistic goals. Every dollar you save now will make a difference in your child's future.